As you know from my interview with Jim Cummings yesterday, he was the person I wanted to see most of all. Second to Jim was Hayley Atwell. 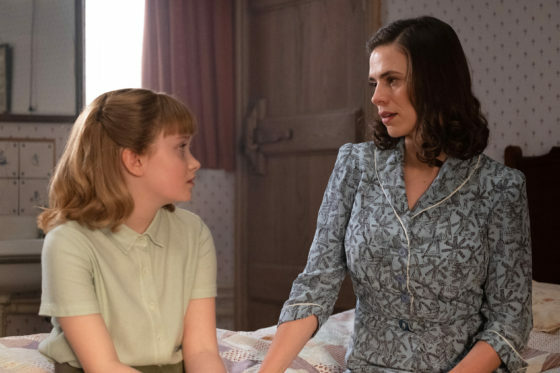 I’ve enjoyed her work as Agent Peggy Carter in the Captain America movies and also the Agent Carter television series. Today I am able to share with you that interview. 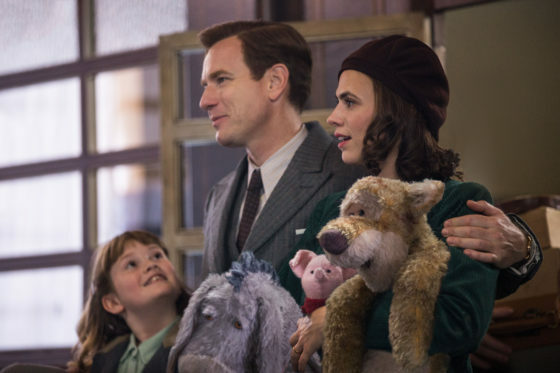 Please enjoy this Interview with Hayley Atwell. I had such a fun time in this interview. I was a bit intimidated to ask her any questions because I kept thinking I’d suddenly ask about things that were non Christopher Robin related like her series Agent Carter. What follows is a lively discussion with Hayley. We went on to ask her how she learned about the project and got involved. I think it was a fantastic story and so I’m putting the full story here. If gives some great insight into who the character of Eveyln is and also shows a bit of Hayley’s fun side, too. So I got my life jacket on and I went on a jet ski and I went very far until pretty much couldn’t see any form of civilization. Then I was able to get reception and I remember answering. 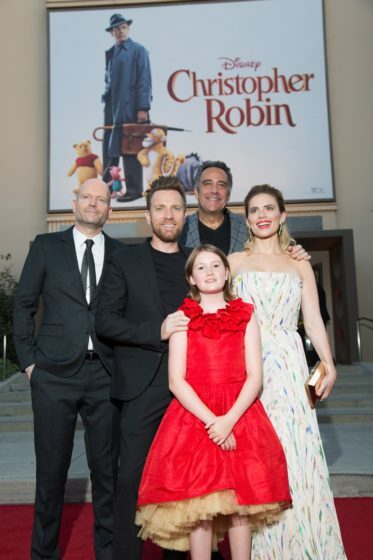 I never met him [Marc Forster] before and I just went, “Welcome to my office. It’s just how I work here. It’s just what I do.” So we broke the ice that way and he was talking about how he wanted to tell a story that was classic to the philosophy of Pooh Bear that everyone knew so that these characters are familiar to everyone, not doing anything kind of left field within these characters because they’re complete in themselves. 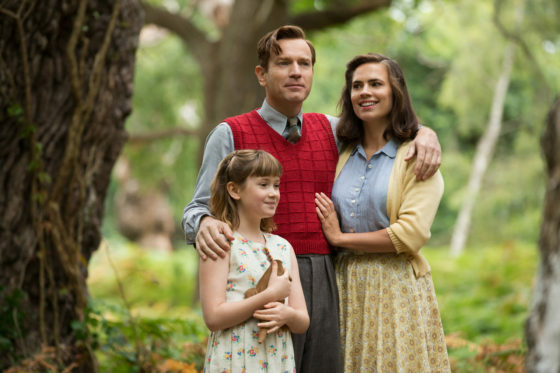 But wouldn’t it be interesting to explore the idea of what happens when Christopher Robin grew up and have that being the access point for adults who would identify with being an adult now. Being burdened and lost a little bit by the pressures of everyday life. Being on a bit of a hamster wheel and not realizing that your ambitions are kind of getting the better of you. So we talked a little bit about that. Then he talked about wanting to create the relationship between Evelyn and Christopher as one where it began with genuine love and joy and he set that up at the beginning that what is at stake for him to lose and you kind of root for them. Evelyn is a strong mother and she does take that pain that she is feeling from that emotional separation from her husband and she protects her daughter. We talked about who Hayley’s influences were in coming to that place. “I have a strong mother and I have strong women in my life. One of them is my auntie Randy who’s over there. I think it’s from those experiences of being with older women who set the way and the safety that I have felt from them at times when the feeling the world is a big place. The the calm kind of voice of reason and strength but a gentleness that comes with that is something that I’d had experienced over the women in my life. Although this is a good feel children’s movie it does touch on things that I think families will identify with. This is the happiest job I’ve ever done. You can’t really do a film like this and have a bad time. Hayley is a bit of a prankster and she loves to be silly and have fun. Just look through her Instagram feed and you can see her being playful and silly and fun. I think back to those musical battles that she had with the cast of Agent’s of S.H.I.E.L.D. 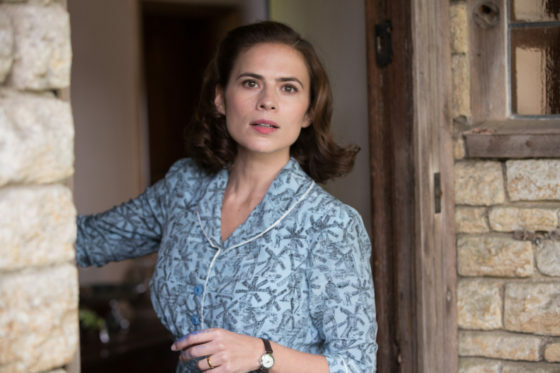 when her show Agent Carter was also on air. I miss that show. He did all sorts of fun and silly things so the question was asked if she pulled any pranks on set. Then we had a ongoing gags that Piglet was the diva who never came out of the trailer and was addicted to haycorns and was a nervous wreck. So we just kind of humanized them. He’s just pure love without agenda. 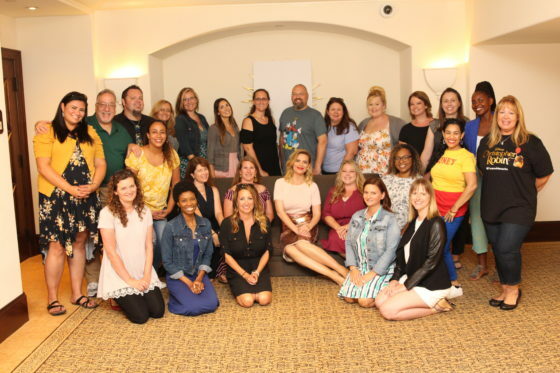 When asked what her favorite character was she went on to tell us, “I think in a way all the animals that are kind of archetypes of different versions of ourselves based on the day of the week or moods that we’re in or circumstances. I always found Piglet to be just totally adorable and so vulnerable and it always made me want to kind of reach out and look after Piglet. Having worked with Piglet, though, it’s just neurotic. It’s like he’s got what we call now in today’s kind of vocabulary is ‘anxiety’ and treated with haycorns which seem to kind of exacerbate his issues. I think he needs like maybe some therapy and medication. I don’t know so as cute as he is I’m like, “it’s just a leaf, Piglet.” I didn’t have as much as patience I think with Piglet as I thought I would. What makes me cry about that is because the way Pooh processes pain is that he just takes it in. Like a dog would. Unconditional love. Instead of attacking back or being defensive about it or finding ways to seek revenge or go, “well, fine!” and walk away as well. He just absorbs that pain but still loves Christopher Robin. That seems to be a very human quality between people that love each other and a very necessary quality to our own civilization. For our own sense of belonging to each other. The ability to absorb pain from someone who knows that they can cause us pain but see beyond that. I just found that moment was so moving and so evolved of Pooh without him realizing it that it made me fall in love with Pooh. 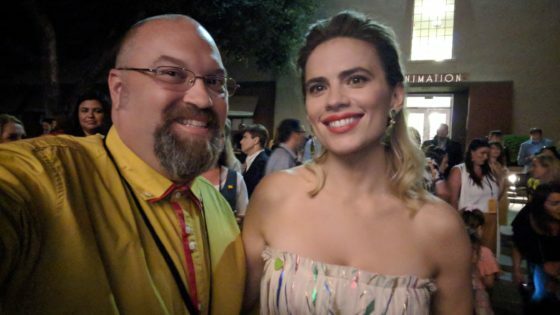 Selfie with Hayley Atweel after the Christopher Robin Premiere. Photo: Me. Confidence Credit: Mitch – GayNYCDad.com.